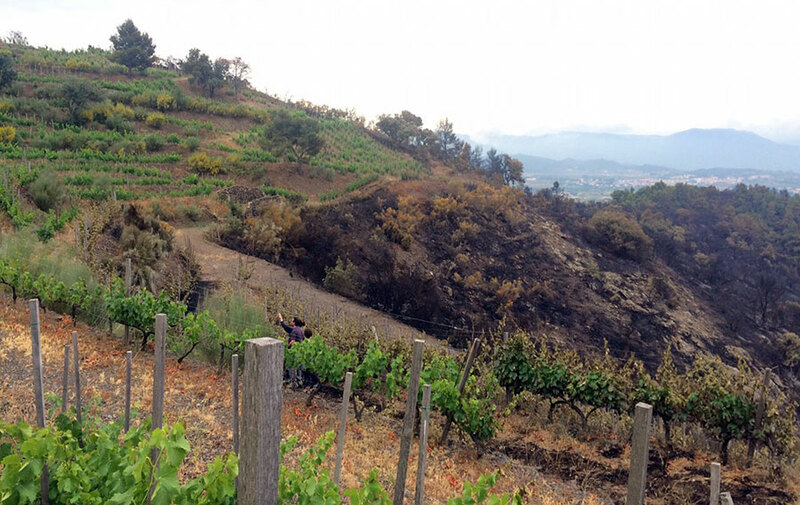 A wildfire broke out in Gratallops, Priorat on June 9th on the mountains around Mas Martinet and quickly moved towards the vineyard of Els Escurçons. Planted in 2000 by Sara Peréz when she took over running the winery from her father, Josep Lluís Peréz, this vineyard is the source of their namesake wine, Els Escurçons. The cause of the fire was determined to be from a lighting strike. These are a relatively common occurrence in Catalonia where the terrain is usually quite dry, scrubby, and otherwise flammable. This fact was exacerbated in Catalonia and especially in Priorat as the preceding days had been abnormally hot for the region. A unique vineyard for Mas Martinet, it sits at 600m and is believed to be the highest vineyard in the region comprised of black slate. With recent vintages Ms. Peréz has been aging the wines in a combination of clay amphorae and glass demijohns in order to present as clear an expression of the locale as possible. A new trip will be needed up there to see the terrain as after visiting with a private wine tour on Monday just before the fire broke out, it has undoubtedly changed a great deal.